7:30pm to 9pm SUE MALCOLM'S SLOW PITCH JAM at The ANZA Club, 3 West 8th Avenue at Ontario Street, Vancouver BC. Learn the ins and outs of bluegrass jamming in a very supportive atmosphere with a fantastic group of players. It's geared for beginners, but more advanced players find it a great way to practice new licks at a slower speed. It's also a wonderful way to learn new songs and meet other bluegrass lovers. Learn more and watch a short video HERE. Join Sue with her Highrise Lonesome bandmates (Don Fraser, Vic Smyth, Jay Buckwold and Stu MacDonald) to learn bluegrass the Slow Pitch Way. Sponsored by the Pacific Bluegrass and Heritage Society. 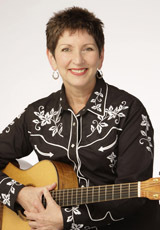 7:00pm to 8:30pm SUE MALCOLM'S BEGINNER FOLK GUITAR LEVEL TWO - Always wanted to learn guitar? It’s never too late! Sue Malcolm is an experienced and patient instructor, specializing in adult beginners. No music reading required. By learning a few basic chords, you can accompany hundreds of songs and discover the fun of playing guitar! Register online at troutlakecc.com. In person registration at the Trout Lake Community Centre, 3360 Victoria Drive. Phone registration - 604.257.6955. All forms of payment are accepted. 7:00pm to 9:00pm SUE MALCOLM's BLUEGRASS JAM CLASS - All levels welcome. For guitar, mandolin, banjo, fiddle, bass, dobro and ukulele. You should be able to play basic chords or melody and speed is not necessary. Learn by ear through lots of singing and playing. An excellent way to practice your instrument, work on soloing, sing lead and harmony, and meet jamming buddies. Singers without an instrument are welcome! There will be one or two community performances at the end of the session. The Slow Pitch Jam Songbook Vol. 5 is required - $20 in class or at Rufus and Bone Rattle. 8 weeks for $120. Drop In is $18. Registration is now open! Register online at troutlakecc.com. In person registration at the Trout Lake Community Centre, 3360 Victoria Drive. Phone registration - 604-257-6955. All forms of payment are accepted. 7:00 pm to 9:00 pm THE SODA CRACKERS are the feature band at the Carnegie Centre at the southwest corner of Main and Hastings in the beautiful Downtown East Side. For more information go HERE. 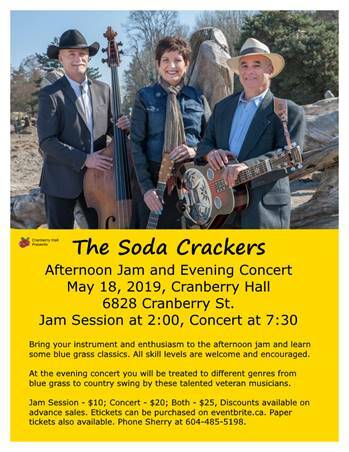 10:30am - 12:30pm THE SODA CRACKERS in a special configuration with Terry Hoffman (guitar) along with Don Fraser (guitar, resophonic guitar) and Stu MacDonald (bass) at the Roundhouse Community Centre, at 181 Roundhouse Mews, near Davie Street and Pacific Blvd in downtown Vancouver. You can get more information at 604.713.1800 or HERE. 9:30pm to 10:30pm THER SODA CRACKERS at the Jericho Folk Club, upstairs in Vancouver's Ocean Access Community Centre - between Jericho Beach and Spanish banks at 1300 Discovery Street (the north end). There's an Open Stage at 8:10pm, and then The Crackers hit the stage about 9:30pm. For more information, call 604-222-4113.